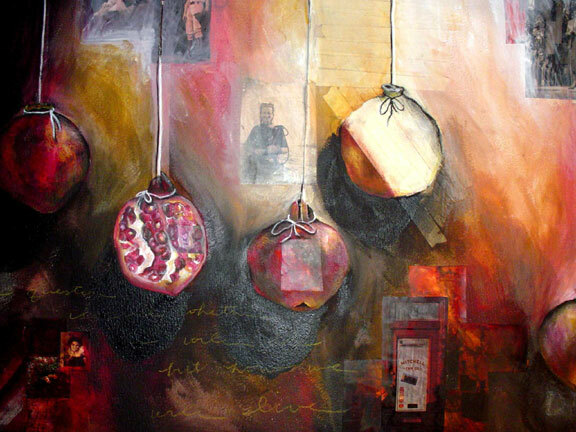 Nicole Brisco teaches art at Pleasant Grove High School in Texarkana, Texas. "Art for me is more than a subject, more than an ideology, or a picture in a book. It is truly a life journey." Read Nicole's Philosophy of Art Education. E-mail Nicole Brisco if you have questions. Students will use figure drawings and their study of the artist Alice Neel to create a finished work using mixed media and text. 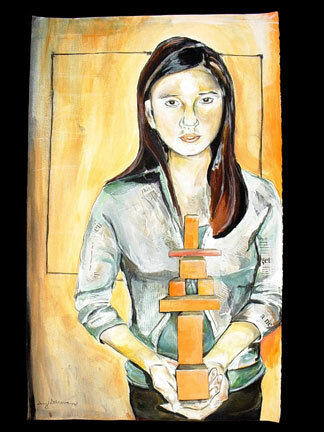 After researching the life and works of Alice Neel, students will realize that there is a strong connection between the artist and its subject. 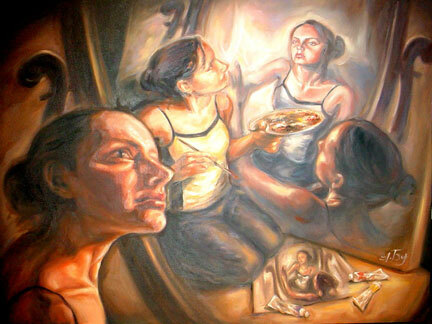 Students will aim to emulate this connection within their own finished figurative works. Light discussion will be encouraged so that the student and model can begin to understand each other. Students should also use their knowledge on composition to create a strong design. Below are some ideas that you might follow to give your work originality. 1 drawing that shows strong sense of composition and drawing technique. Included must be a strong light source. 1 drawing that shows a strong sense of composition and drawing technique. Included must me a controlled and mature sense of color. 1 drawing that shows a strong sense of composition and drawing technique. Included must be a confident contour line with strong weighted line. 1 drawing that shows a strong sense of composition and drawing technique. Included must be a challenge with media. Each piece will be worth 100 points. If you have any questions please let me know before they are due. Additional small drawings will be assigned, but it is your responsibility to finish each drawing and allow yourself time to complete each individual assignment. Art Criticism over two works by Neel. Alice Neel - Alice Neel (1900-1984) talks about her life, her ideas on art, and the world at large in this book. She painted well-known figures in art, literature, music, politics as well as her family and friends - depicting them clothed and sometimes naked, thus exposing their vulnerability. Never compromising, she kept to one goal: to paint people as she saw them. Alice Neel - With 224 illustrations, 86 in color, and essays by curators from various museum venues, this is the most comprehensive and up-to-date view of her work. Alice Neel: Painted Truths - This book brings together paintings that demonstrate Neel's range and ability, along with insightful commentary from four leading art historians. Although the book focuses on her portraits, it also covers the artist's early social realist paintings and cityscapes, tracing the evolution of Neel's style and examining themes that she revisited throughout her career. Students will select an object of interest using symbolism. Students will then create multiple original drawings to incorporate into their mixed media work. Students will research narrative/symbolic works and mixed media works. Students are to draw from life in their work and use the compositional skills they have learned. Composition (use of space), technique, originality, expression of drawing, layers, use of media, craftsmanship, and aesthetics. See additional image for this lesson. Utilizing the theme of "community", students will select an object that represents this to them. Students will take this object and create a mixed media work that demonstrates the following: design, color, creative use of media, purposeful thinking. Brainstorm and select an object. Example: Pomegranate. 24X36 (61 x 91 cm) surface. 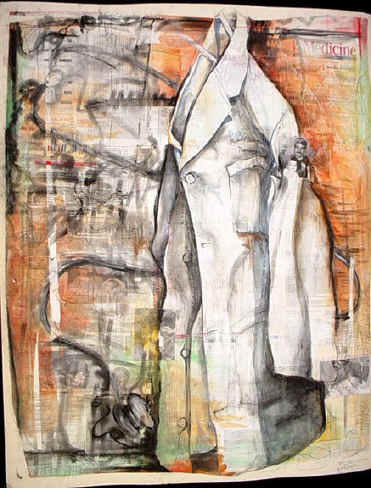 Your finished work should be influenced but not limited to the work of Robert Rauschenberg. At the end of the six weeks you will have the following due. 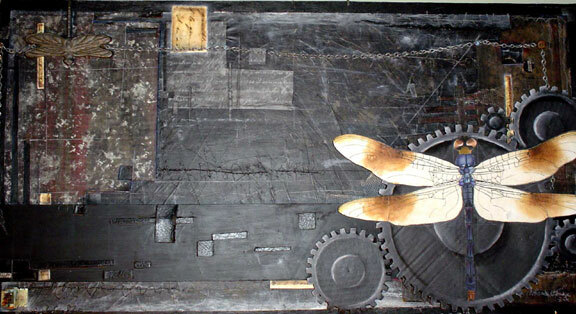 One completed assemblage not to exceed in size any direction by 36 inches (91 cm). This assemblage should be reflective of your original thumbnail sketch. This work will be worth 100 points. If you have any questions please let me know before it is due. It is your responsibility to pace and use your time well. Graded: Overall Design, Use of a Three-Dimensional Space, Originality, Craftsmanship. Additional pertinent information or drawings. Art Criticism over two works by Rauschenberg. Intimate Portraits - "A Look at Human Behavior"
They say that humans spend 95% of their lives in uneventful moments, but we as humans usually document the only the most eventful moments such as, birthdays, graduations, births, and special occasions. As artist, we have the opportunity to make these ordinary moments extraordinary. Looking at human nature can be very interesting if you choose to look closely. 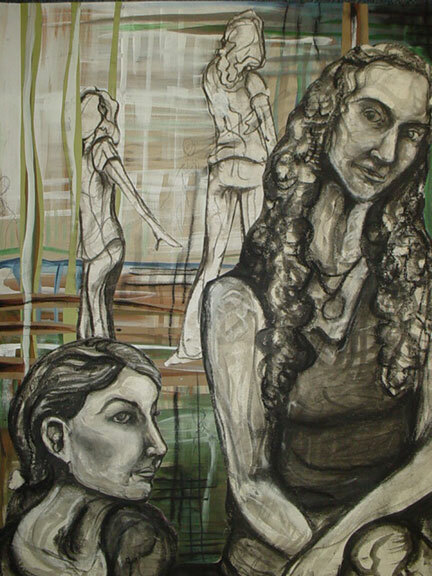 Students will create a figurative work based on a simplistic time in a friend or family member’s life. 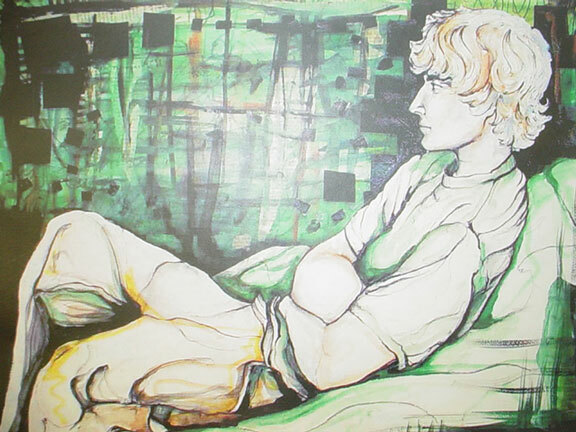 The overall goal is to connect the viewer with the person represented in the work See student art. At the end of the six weeks you will have the following due. One completed intimate portrait of a friend or family member. This work should represent the person in a personal way. Students should create a unique source of light or innovative color use. Graded On: Overall Design/Composition, Originality, Craftsmanship, Drawing/Expressive Line, Intimate or Connection to Viewer. Art Criticism over finished work. One completed ¾ to full body self-portrait. 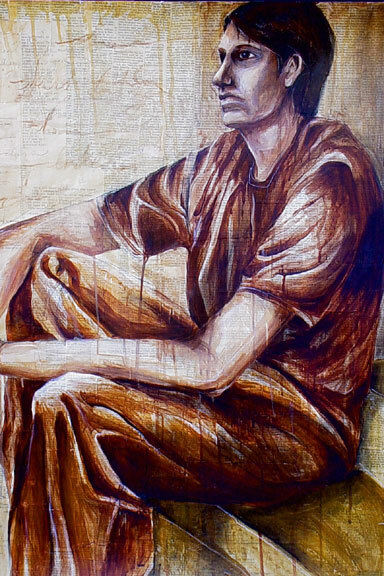 This work should represent you how others might perceive you in a creative and original way. Graded On: Overall Design/Composition, Originality of Reflective Identity, Craftsmanship, Drawing/Expressive Line, and Communication Factor. 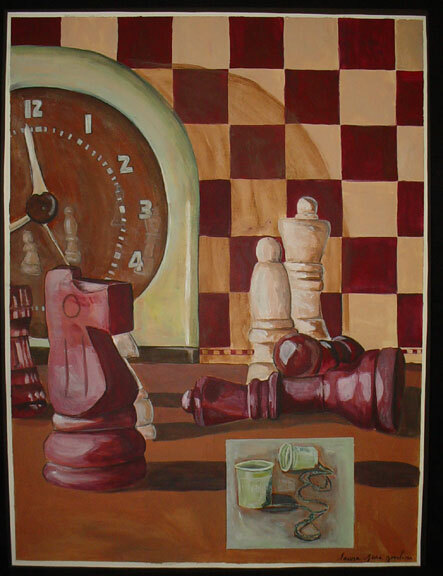 The Game of Life - "A Comparison of the Two"
Your finished work should be influenced but not limited to your inspiration artist. At the end of the six weeks you will have the following due. One completed painting/drawing/collage not to exceed in size any direction by 36 inches (91 cm). This work should be reflective of your original thumbnail sketch. Graded On: Overall Design/Composition, Originality, Craftsmanship, Drawing/Expressive Line, and Communication Factor, and Life Connection. See additional images for this lesson.